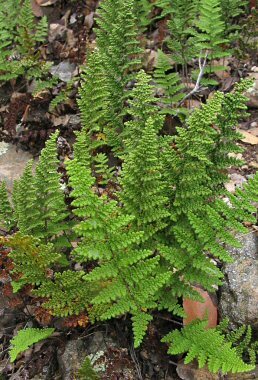 Lindheimers Lip Fern is a member of the Fern Family. It grows to 6 inches in height at lower elevations and up to 11 inches at higher altitudes. Leaves of the plant are green with beaded segments. It typically grows on dry slopes in rocky areas at elevations between 2000 and 8000 feet. Lindheimers Lip Fern is also known as Fairy Sword. Lindheimers Lip Fern typically grows in rows.